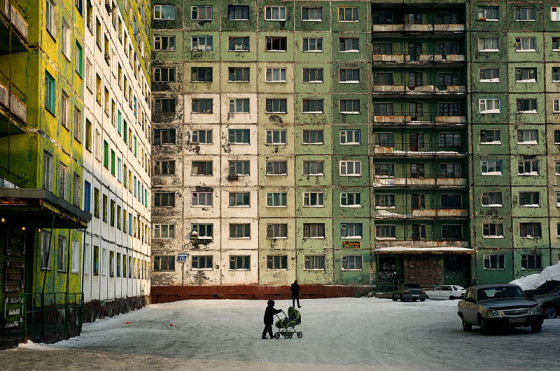 Here it is: Norilsk – photographed by Russian photographer Elena Chernyshova. You’ve probably never heard of the city, and there’s no particular reasons you should have. Its list of achievements include being the 7th most polluted city in the world. That’s no surprise, Norilsk is a mining city, the closest to the polar circle. Its mines and metallurgical factories were constructed by prisoners of the Gulag. All together, there’s no happy story there, and yet, there’s something charming in these photos looking into life there and, in Chernyshova’s words, looking at ‘human adaptation to extreme climate, ecological disaster and isolation’. I love the photos, their details, hidden symbols and atmosphere. But life there must be really tough.